Erno Rubik is a Hungarian architect and inventor, who is best known for inventing the popular mechanical puzzle known as Rubik’s Cube. Rubik was born in Budapest, Hungary in 1944 and has lived in Hungary his entire life. Both his parents were educated and well to do; his father was an aircraft engineer and his mother was a poet. Rubik initially studied sculpture at college but later went back to study architecture at the Academy of Applied Arts and Design. After graduating, he worked as an architect between 1971 and 1975 and later became a professor of Interior Design at the his alma mater. During this time, he started building designs for a three dimensional puzzle which later came to be known as the Rubik’s cube. Rubik did not aim to create a best-selling toy; his interest lay in the structural design aspect of it. He later stated in an interview with CNN that what he aimed to create was an interesting design problem for his students. The Rubik’s Cube consists of 26 small individual cubes, joined together into one big cube consisting of 6 sides, with each side having nine squares. Each layer can twist and overlap with the other layers. Any three squares in a row can join a new layer by being twisted either horizontally or vertically, but not diagonally. Rubik initially tried to hold the cubes together with elastic bands but this structure did not twist properly so he individually carved and put together the little cubes into one big cube. Each side of the cube was of one uniform color but different sides were of different colors. Once Rubik had assembled the cube, he started twisting and turning each side so that the uniformity of colors was lost and the cubes seemingly appeared to be in random order. The real challenge came when Rubik tried to set the pieces together back in their original position but realized that the order of the little cubes had been so disturbed that he could not retrace his steps and put them back together. According to Rubik’s own statement, he said that it was like taking a walk in the woods and coming across different sights, but being unable to recall the way home because you had wandered so far away from it. This was how the puzzle of the famous Rubik’s cube was invented in the spring of 1974. 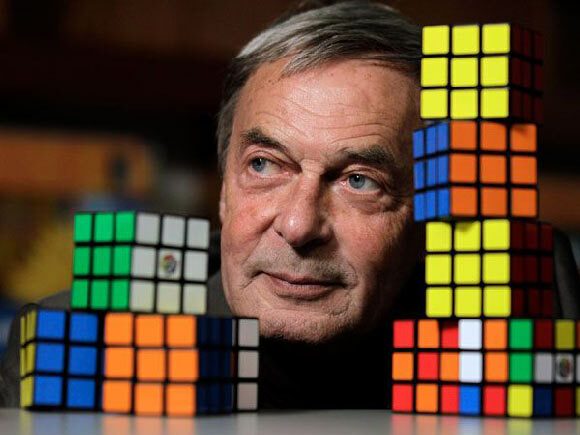 Erno Rubik knew that by randomly twisting and turning the cubes he could never revert it to its original form so he tried to work out a logical solution. He was able to obtain this within one month and then applied for a patent at the Hungarian patent office. He was able to obtain this in January 1975. His idea was bought by the Ideal Toy Corporation. Sales were initially poor until a Hungarian businessman and amateur mathematician Tibor Laczi discovered it and acquired the rights to sell it. Laczi demonstrated the Cube at the Nuremberg toy fair where a British toy expert by the name of Tom Kremer saw it and was so impressed that he ordered a million Cubes from Ideal Toy. The toy achieved international acclaim and along with it, its inventor became famous and successful. Rubik became the first self made millionaire from the communist block of countries. People formed clubs to play together and discover solutions. A 16 year old high school student from Los Angeles won the world championship held in Budapest in 1982 by solving the Cube in 22.95 seconds. Experts are able to solve it in 24-28 moves. The Rubik’s Cube became an icon in the 1980s and is manufactured and sold worldwide to date. Erno Rubik has set up a foundation to help aspiring young inventors in Hungary. He has also manufactured similar toys such as Rubik’s Snake, Rubik’s Magic and Rubik’s 360. He currently resides in Hungary and is 71 years of age.